Known by various terms like TMD, TMJ, the temporomandibular disorder is a difficult condition to be managed, being under the purview of a dentist as well as an orthopaedician. Even, general physicians, physical therapists and other practitioners tend to handle these cases. As the name suggests, this is a disorder pertaining to the joint between the upper and lower jaw, formed at the temporal part of the skull, where the lower mandible joins it, slightly in front of the ear lobes. Anatomical considerations – Under normal human anatomical structuring, a person has two TM joints on either side of the face, which is a joint like any other joint in the body with synovial fluid, joint space and muscles and other tissues surrounding it. Primarily, this joint functions towards coordinated movement during chewing, yawning, opening up of the mouth and biting. Any flaw in the movement of this joint can cause problems inside the cheek and bite and also can lead to spasmodic and painful conditions of the muscles of mastication. Hence, TMJ disorder treatment should be initiated at the earliest with the proper analysis of the symptoms and consultation with doctors. Sometimes, due to chewing of hard objects, there is slight traction on the joints, which result in pain as there are muscle pulls around the joint space. Most common symptom of a TMJ disorder would be pain at the point in front of the ear or there will be difficulty in opening of the mouth. These are induced problems, which arise due to exerting movements of the jaw. In some cases, patients have fibrosis or dislocation of the joint, due to which there is inability of proper closure of the jaws. This is mostly presented as malocclusion of the teeth, resulting in biting problems. Some of the other symptoms of TMJ disorder are tinnitus, ringing in the ear, popping sound while moving the jaws and headache. In these conditions also, a proper assessment of the TMJ disorder should be conducted, to rule of the joint involvement. One of the common points of discussion related to TMJ disorder treatment is the modality with which the initiation of therapy should be done, and it has been divided into conservative or Phase I treatment or the surgical or Phase II treatment. In conservative modalities, there is no change done in the structure of the bones or the joints. In the surgical restoration, the patient has to undergo surgery on the jaw. Without even causing surgical interventions, TMJ arthroscopy in Delhi is becoming a popular mode of TMJ disorder treatment. Most dentists and TMJ disorder specialists are of the view that there is no need to go for surgical interventions if there is no indication for surgery. Most of the disorders can be corrected by conservative approach. Conservative treatment – In the conservative method of treatment, there are options of bite splints, pain medications, physical therapies, injections and behavioural changes. Bite splints are common appliances used to correct the bite positions of the teeth. These are put between the teeth to decrease the pressure on the joints during chewing or biting. Variants are available in form of partial and full coverage splints. There are also directive splints with holes to fit the teeth and the permissive splints for gliding movements. Pain relief – In the phase I or conservative approach, the aim of the TMJ disorder treatment is to decrease the pain and provide comfort by relaxing the movement at the joints. Pain killers help lower the pain, while massages can help relax the spasmodic muscles. Sometimes steroids or botulinum toxins are injected to relief the spasms, if these are not treatable by pain killers and massages. Surgical interventions – In the phase II surgeries, there are alterations done in the muscles and the joints. These kinds of TMJ disorder treatment involve the orthodontics, maxillofacial surgeons and sometimes plastic surgeons. Often after the failure of months of conservative therapies or if the patient is a direct candidate for surgery, then the surgical techniques are adopted. Surgery is required by only a few of the patients, after thorough assessment and when other conservative means have failed to elicit any benefits. Advanced forms of TMJ arthroscopy in India are also options for surgery for such disorders. Mostly for limited jaw opening, resulting from fibrosis or fracture of the jaw bones, there are surgical techniques, which are introduced into the TMJ disorder treatment. In this section, there are some surgical methods like arthrocentesis, arthroscopic repair, TMJ microsurgery or open surgery. Arthrocentesis is a simple procedure carried out for draining the fluids deposited inside the joint space. TMJ Arthroscopy surgery is about introducing arthroscope into the joint space and repairing cartilages. In the microscopic procedure, there is an incision done in front of the ear, through which the interior surgeries are carried out. TMJ arthroscopy in India has nowadays become quite common. A number of patients are being provided with surgeries of TMJ arthroscopy in Delhi, if they have the need to undergo surgical procedures. Open surgery is a major surgery, with cuts and incisions, which lays open the region and allows better view of the temporamadibular joints. 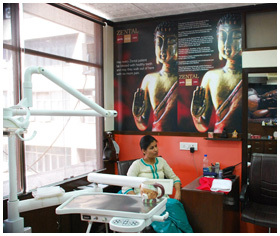 Nowadays, advanced surgical techniques have helped in finer results with replacement of joints, but this is being done in few centres, only by expert TMJ disorder specialists. In general, simpler TMJ symptoms can be handled by the general physicians, dentists or family doctors. The conservative TMJ disorder treatment is easy to provide and can be helpful for many people at primary and secondary health care set ups. But, Phase II surgeries are necessary to be done by qualified TMJ specialists, who may be helped by dental surgeons or plastic surgeons and sometimes orthopedicians. Since TMJ arthroscopy instruments are available and the costs have come down, TMJ arthroscopy in India is being performed by trained arthroscopic surgeons. Alternatives – There are some alternative treatment modalities for TMJ disorder, such as Transcutaneous Electrical Nerve Stimulation, ultrasound therapy and radiowave therapy. Their effectiveness in the TMJ disorder treatment has not been established strongly, although the nature of the disorders warrants a mix of variety of treatment procedures. Since surgical corrections are counted among the last resort of treatment, conservative treatments should be stressed upon first to provide maximum relief from the symptoms and pathology of temporomandibular joint disorders.